Anas platyrhynchos (mallard) is the ancestor of almost all of the varieties of domestic ducks. Mallards can be found almost anywhere in the world, with the exception of Antarctica. They prefer a habitat of wetlands that include large amounts of vegetation. They eat a large variety of foods that include: vegetation, insects, worms, gastropods, arthropods, as well as a variety of foods provided by humans. Mating occurs from October to March, and 9-13 eggs are layed in a ground nest near water. The eggs hatch after 26-28 days, and the ducklings are led to the water by the mother hen (Rogers, 2001). Anas platyrhynchos is a member of the family Anatidae, which is comprised of 45 genera and 157 species of ducks, geese, and swans (Howard, 2003). They are characterized by: loss of a pneumatization of the processus mandibulae medialis; loss of a notarium (reversed in Tadorna); a sternum that lacks foramina and bony striations in the pars cardiaca; a scapula with a long and pointed acromion; and a tarsometatarsus that has the medial trochlea located in a more proximal and elevated position (Ericson, 1997). Anatidae is a member of the order Anseriformes, which also includes the families Anseranatidae and Anhimidae (screamers). Anseriformes, along with Galliformes, are thought to be among the earliest members of Neognathae. Although the sister group relationship of Anseriformes and Galliformes is very contentious (Sibley and Ahlquist, 1990; Ericson, 1996; Mindell et al., 1999; Mayr and Clarke, 2003;), the monophyly of Anseriformes is well established. 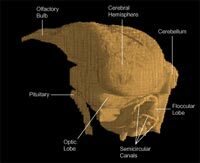 Some of the synapomorphies that support this monophyly are: distinctly, ventrally excavated processus postorbitalis; palatine with the internal laminae obsolete; processus mandibularis of the quadrate inflated posterior to the quadratojugal articulation; two-condyle articulation between the quadrate and mandibula; and a tibiotarsus with the distal opening of canalis extensorius equally far from either condyle (Ericson, 1997). This specimen was made available to The University of Texas High-Resolution X-ray CT Facility for scanning courtesy of the Texas Memorial Museum Vertebrate Paleontology Laboratory. Funding for scanning was provided by Mr. Dave Dufeau. Funding for image processing was provided by a National Science Foundation Digital Libraries Initiative grant to Dr. Timothy Rowe of The University of Texas at Austin. This specimen was scanned by Richard Ketcham on 12 May 1998 along the coronal axis for a total of 372 slices. Each 512x512 pixel slice is 0.5 mm thick, with an interslice spacing of 0.4 mm and a field of reconstruction of 62.5 mm. Ericson, P. G. P. 1996. 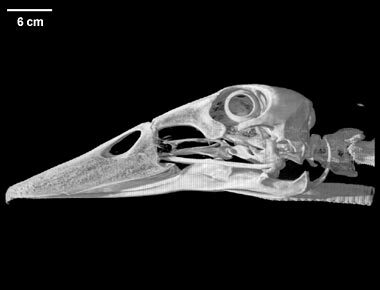 The skeletal evidence for a sister-group relationship of anseriform and galliform birds-a critical evaluation. Journal of Avian Biology 27:195-202. Ericson, P. G. P. 1997. Systematic relationships of the palaeogene family Presbyornithidae (Aves: Anseriformes). Zoological Journal of the Linnean Society 121: 429–483. Mindell, D. P., M. D. Sorenson, D. E. Dimcheff, M. Hasegawa, J. C. Ast, and T. Yuri. 1999. Interordinal relationships of birds and other reptiles based on whole mitochondrial genomes. Systematic Biology 48:138-152. Sibley, C. G., and J. E. Ahlquist. 1990. Phylogeny and Classification of Birds: A Study in Molecular Evolution. Yale University Press, New Haven, 976pp. Anas platyrhychos on the Animal Diversity Web (University of Michigan Museum of Zoology). Labeled left lateral view of the endocast of Anas platyrhynchos. To cite this page: DigiMorph Staff, 2004, "Anas platyrhynchos" (On-line), Digital Morphology. Accessed April 25, 2019 at http://digimorph.org/specimens/anas_platyrhynchos/skull/.